Sony is working to reduce its environmental footprint to zero by 2050, and has set a series of environmental medium-term targets to get there. As the first step, Sony set the Green Management 2015 environmental mid-term targets which spanned fiscal 2011 to 2015. In April 2016, Sony introduced the Green Management 2020 environmental mid-term targets to be achieved by fiscal 2020. This transition takes Sony's environmental activities to the second stage of its journey to a zero environmental footprint. 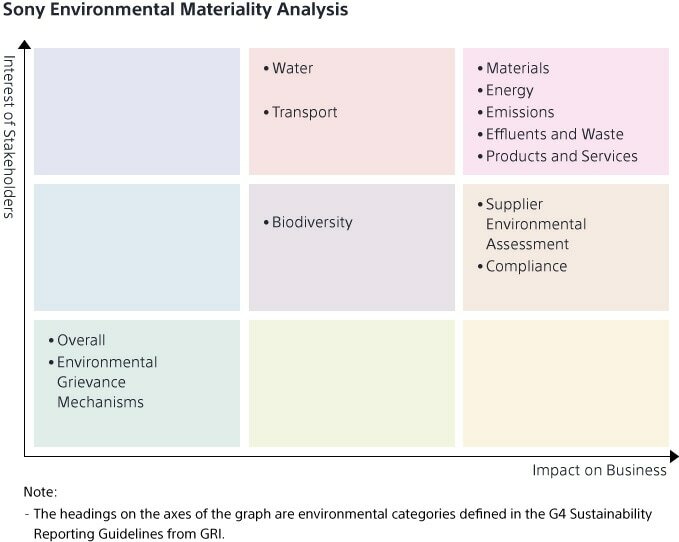 When formulating Green Management 2020, Sony examined its past environmental activities and conducted a materiality analysis*1 in order to incorporate the viewpoints of stakeholders outside the Sony Group. Based on these results, Sony specified raw materials, energy, atmospheric emissions, effluents and waste, and products and services as priority areas to tackle by 2020. It then designated water, biodiversity, and environmental assessments of suppliers as important issues to deal with. Sony has been addressing all of these issues already, and continues to focus on initiatives to address them through fiscal 2020. *1A materiality analysis is a method for identifying and specifying important issues for a company and its stakeholders. Under the Green Management 2020 environmental mid-term targets, while the Sony Group is strengthening its internal initiatives to reduce power consumption in products and decrease greenhouse gas emissions from sites, Sony is expanding the reach of its environmental initiatives to outside the company such as: reaching more than 500 million people worldwide with its campaigns to raise awareness of sustainability issues, and encouraging consumers and other social groups to take action; and working with its component suppliers and manufacturing contractors to reduce their environmental footprint. 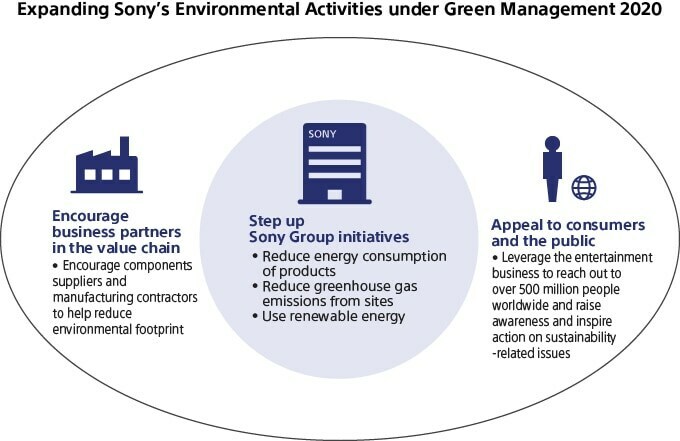 Sony is being recognized by stakeholders for setting goals and taking action under the Green Management 2020 targets. Sony's climate change targets have been approved by the Science Based Targets initiative*2. This, in turn, led to Sony's involvement in the "Take Action" climate change initiative of the We Mean Business*3, an international coalition of businesses and investors. Starting in fiscal 2017, Sony will also participate in the We Mean Business coalition's "Improve Water Security" initiative to reduce water risks. *2For more information, please refer to the Science Based Targets website. *3For more information, please refer to the We Mean Business website. Sony organized its activities under Green Management 2020 according to the six stages of the product lifecycle: product/service planning and design, operation, raw materials and components procurement, logistics, take-back and recycling, and innovation. In each of these stages, specific targets are set under the four categories of climate change, resources, chemical substances and biodiversity.